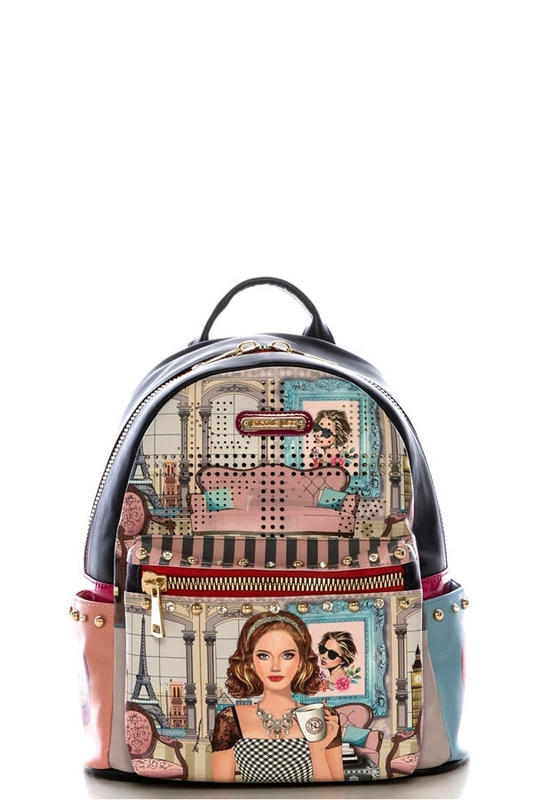 Amplify your sophisticated style with the Nicole Lee Pascale Print Backpack. Exterior Features: NL exclusive print at front with signature studs and rhinestone. Made of vegan leather. Laser cut design at front. Open side pockets. Front zip pocket. Metal zipper closure with NL monogrammed zipper pull. Top handle with NL authentic medallion on handle. Monogrammed back pack straps. Structured silhouette and NL nameplate at front. Interior Features: Large compartment, zipper wall pocket with NL nameplate, vegan leather key chain, double open wall pockets at front, laptop compartment and NL nylon lining. Vegan leather handle with 3" inch drop. Includes adjustable and detachable 23" - 29" inch shoulder strap. Colors available are Ara Loves Morning Coffee, Wow Its Lucy, House Party, Angelina Follows Dreams, Vivian Dreams Paris, Venecia Loves Make Up, Yarissa, Paola Is Tomboy, Super Roxana.